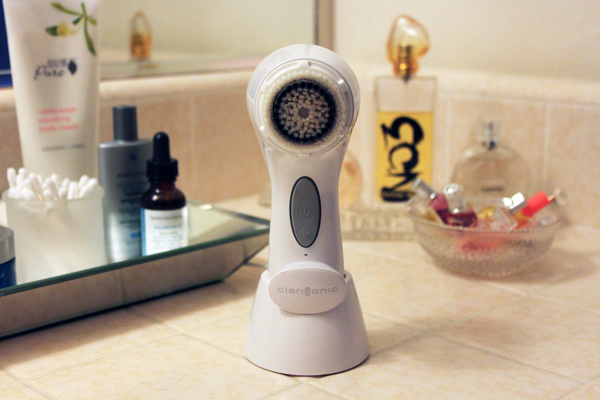 I might be the last one to get a Clarisonic, but I have to write about it anyway—it’s THAT good. I held off on buying one forever—it just seemed kind of gimmicky and unnecessary, like I wasn’t capable of washing my face properly on my own—but then I heard that it leaves your skin so clean that serums, lotions, and the like work better and since I sometimes splurge on pricey products, I want my money’s worth. Now, about ten months later, I think my clearer, more glowy complexion still has everything to do with this handy little device (drinking one of these every morning also helps). I try to use it most nights, and if I slack off, I notice a difference, usually in the form of a breakout. Also, after finally replacing the brush after an embarrassingly long time (Clarisonic recommends every three months; I was pushing nine), my skin looked better immediately. Conclusion: This thing works! The only downside? My dog hates it. I held out forever too and am so glad that I reconsidered! LMK if you try it! Ingrid bought one a few months ago and LOVES it, and now you too. That's it, time to give it a try! Thanks for sharing. There are a few types of Clarisonics. . . how did you know which one to buy for yourself? I am considering getting one (pregnant with numero 3 and my skin it a hot mess when I have a bun in the oven) but still researching :) Thanks for your review!! Hi Britney! I went with the Aria because it's the newest model and has a couple features that not all of the other models have, such as three different speeds and a drying stand. It's a bit more expensive than the other models, but I felt it was worth it for the drying stand alone! Hope that helps!